Eagle Island was advertised as an escape to a luxurious lodge on a private, 10-acre back barrier island. I didn’t even know what a back barrier island was, but this region of the Georgia coast was named “one of 75 last great places left in the world” by the Nature Conservancy. I had to go. He explained that back barrier islands, situated between barrier islands and the coastline, form one more line of defense against storms. The gazillion islands along the Georgia coast are surrounded by marshes, which are a nursery for water and bird life. They change by the minute, by the hour, by the day. The scenery alters with each incoming and outgoing tide. The marshes provide food for wildlife and act as a filter for the entire ecosystem, cleansing with each tide. Marshes are live, complex creatures; it takes work and time to get to know them. Hill helped us carry our suitcases and food supplies up the oyster shell path to the three-story lodge. We were the only human inhabitants for miles around. As his boat sped away from the dock I felt panic start to rise in my throat. What in the world made me want to come to this isolated hump of dirt in the Atlantic Ocean? I like to leave an escape route available, and now we were alone, with no way off the island. I was cut off from the world as I know it. Obviously, my challenge was to deal with nothing to do and nowhere to go for three days. The first thing I did was explore my little domain. A rough path had been cut through the primeval forest of palmetto, long leaf pine, hickory and live oaks, with the ubiquitous Spanish Moss stringing to the ground. It is about a 15-minute stroll at low tide with lots of photo ops. 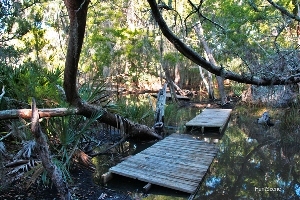 At high tide there is not enough dry land to walk very far; even the board walks are suspended in marsh water. Numerous man-made shell mounds are on the island, leading to speculation about how they got there, who brought them, and why. It turns out my challenge was deciding which chair, lounge or hammock to sink into to read. Is it nicest inside by the fire or on the sunny end of the wrap-around deck? Is the light right for a walk to take some photos? Are the tides right for a spin in the kayak? Maybe I’ll just take a nap. Gradually, I felt myself reconnecting with nature. There were a massive number of birds on our island, and a nesting pair of eagles. There was the ongoing, complex life of the tidal marshes. There were the ever-present tidal currents, spectacular sunrises and sunsets, crisp nights and warm days. Breezes bent the high tree branches. The long-ago-forgotten, endless starry night sky stirred childhood memories. When the air was still, it was blissfully silent. I felt my entire body relax and I was as happy as a cat soaking in the warm sunshine, reading my book. The most difficult thing about Eagle Island is letting yourself just “be.” That was my lesson. Of course, the selling point of these private island getaways is that there is nothing to do! That is why Hill’s islands make a great family vacation or a corporate retreat. People actually end up talking — and listening — to each other. The Georgia marshes are one of the last great places on earth. Fly into Atlanta and connect on Delta to Brunswick Airport. Someone will pick you up and drive you the 15 minutes to the dock in Darien. Call Capt. Andy Hill, 912-638-0306, or check www.privateislandsofgeorgia.com for availability. All rates include round-trip boat transportation from Darien to Eagle Island. There is a two-night minimum for all winter packages. July and August require a one-week package. Hill customizes each getaway to clients’ requests. Special discounts are available for those with their own boat. 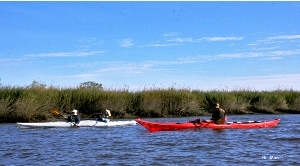 All the islands are only a 10- to 15-minute ride from the Intercoastal Waterway.